Here’s my first follow up post about the Noris colour, the coloured pencil made using Wopex material, which has been mentioned in a previous blog post. 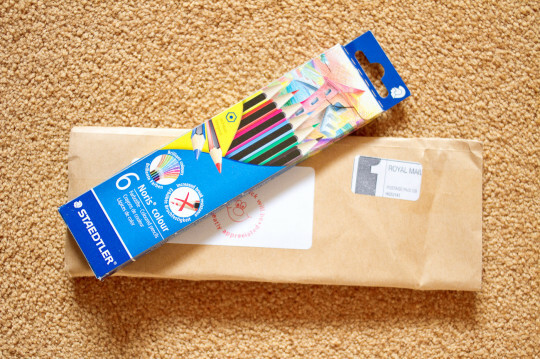 I bought my set of six Noris colour for £2.49 (~$3.76; €3.46) on eBay. There are also sets with 12 and with 24 pencils available. 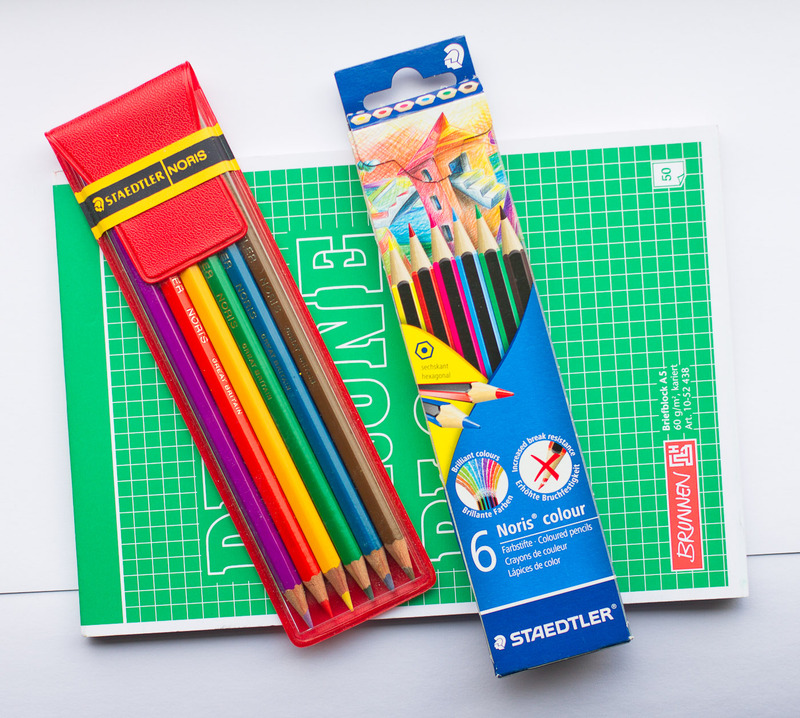 As explained earlier I have been looking for a coloured pencil, one that is suitable for writing, for quite a while now. The Noris colour is one of the best pencils for this purpose I have seen so far. The average normal pen force used to write the sample lines was approximately 1 Newton. I don’t know the average axial pen force. There was obviously a lot of variation as I wrote by hand – with more force being used for downward strokes. As you can see the point broke a few times. It would be great to have a pencil hardness tester, like the Elcometer, to make these tests more objective1. All pencils were sharpened using the Deli 0668, i.e. with an angle of approximately 20°. The Deli was dialled back one full rotation (360°) do avoid creating a point that will break too easily. Old and new Noris coloured pencils. The old ones didn’t take part in the comparison. 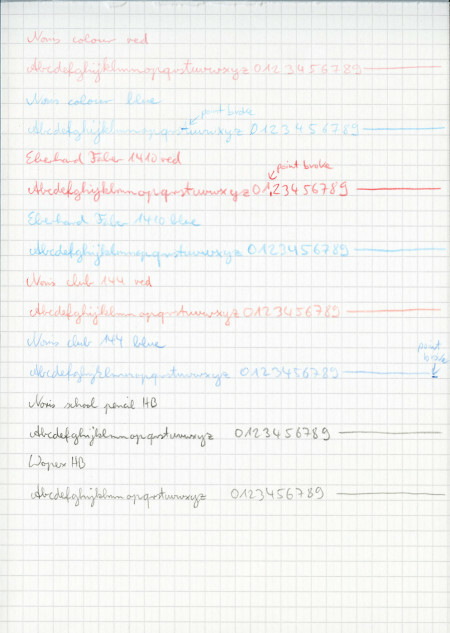 All pencils, the Noris colour, the Eberhard Faber 1410 and the Noris club 144, had an initial line thickness of 0.1 mm – 0.3 mm (vertical / horizontal variation). The point of the Noris colour wore down the least. After one line of writing the line variation was 0.3 mm – 0.5 mm. The point of the Eberhard Faber 1410 wore down the most. After one line of writing the line variation was 0.5 mm – 0.6 mm. The point wear of the Noris club 144 was in the middle. After one line of writing the line variation was 0.3 mm – 0.6 mm. The Noris colour performed best. Subjectively the point felt better than what the numbers suggest, but then the Noris is also the pencil that left the lightest mark. 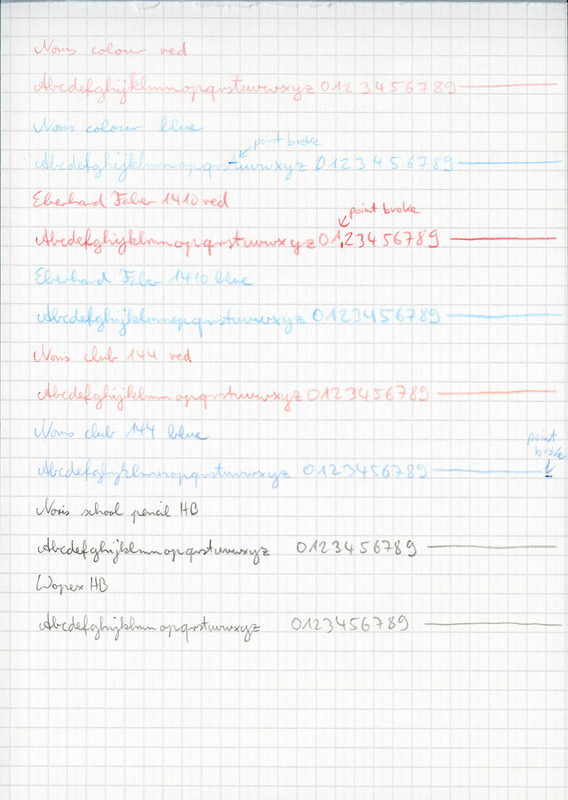 The Eberhard Faber 1410which wore down fastest left the strongest marks on paper. Despite the light marks the Noris colour is in my opinion the best pencil for writing or marking. It is also easy to erase. Price Noris colour: February 2015. I bought the Brunnen notepad in August 2011 in McPaper, Schweinfurt (Germany) for €1.19 (~$1.29; £0.86). I bought the Noris Club pencil in 2008 from Woolworths went they into administration. I don’t remember the price. I bought the Eberhard Faber pencils in 2010. More information about them can be found in this blog post. 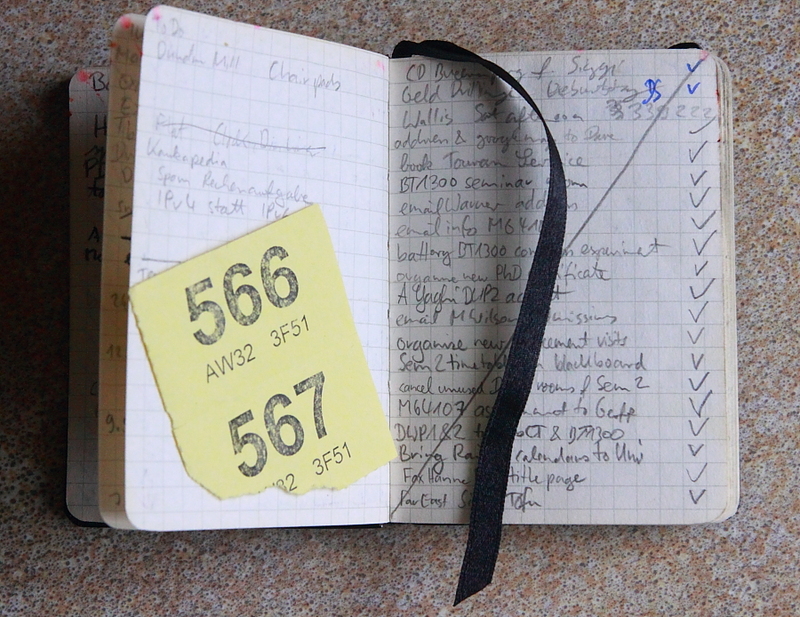 Nearly three years ago I bought a Brunnen Kompagnon notebook, a quite small one (A7, i.e. 74 mm x 105 mm, ~ 2.9″ x 4.1″) so that it fits in my shirt pocket. I wanted a small notebook I can carry with me on a daily basis and thought I give the Kompagnon a try. I paid €8.60 (~ $11.70; £7.50) at myPens and ordered a few others things as well – to reach €30 as they offer free shipping in the EU for order above €30. I cannot say that the quality of this notebook was poor, but after such a long time of carrying it around with me on a daily basis and using it on a nearly-daily basis it is definitely not in great condition any more. Quite early I also ripped a page or two out of the back, but didn’t know that the Kompagnon doesn’t really like this. It didn’t take long before neighbouring pages became loose.The plastic cover near the spine got damaged over time, too. I fixed it with double-sided 3M tape, but that didn’t solve the whole problem. The plastic stuck to the spine, but over time the corners have now ruined two shirt pockets. Time to replace this notebook, but unfortunately there isn’t much choice when it comes to A7. I’d prefer a slightly thinner notebook, too. The 192 pages of 80g/m2 Munken paper and the cover and pocket mean that the Kompagnon is about 1.5 cm thick. I found the Samsonite basic notebook in A71, but it is 1.5 cm thick, too. The Staufen Poème is an A7 notebook with 96 pages of 80g/m2 paper, so it might be thinner. Another alternative I found is the X17 system, reviewed at Notebook Loves Pen. 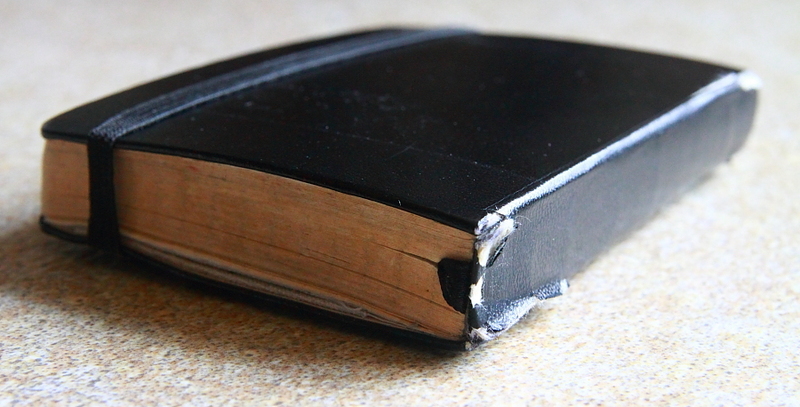 The Mode A7 version, made from bonded/regenerated leather (“Lefa”), for two booklets looks very interesting, but I am not sure whether it is too thick. A version for one booklet is supposed to be released later this year. Does anyone have a suggestion for a “not too thick” A7 notebook? Wikipedia has an interesting chapter about the history of the A paper formats. There is a good explanation on the server of the University of Cambridge. When I started school and we learned how to write we were using writing slates, probably because you can practise again and again without wasting paper. They were not really made of slate, instead they were a bit like a laminated piece of paper, just that the plastic used is much harder and that the surface was not smooth. A few months ago I found my old writing slate again, together with the sponge to clean it and the pencil to write on it. The sponge came in a container that could be closed – nice when you want to transport it, but not nice if you do not let the sponge dry out from time to time, as the old water will get smelly. The pencil was a “Heft und Tafel” (exercise book and chalkboard) pencil from A.W. Faber-Castell. As the name suggests they can be used on slate and on paper. You can still get the “Heft and Tafel” pencils today. I bought the white Goldfaber pencil you can see in the photo in April 2010 from Bürobedarf Jäcklein in Volkach for € 1 (~$ 1.38; ~85p). 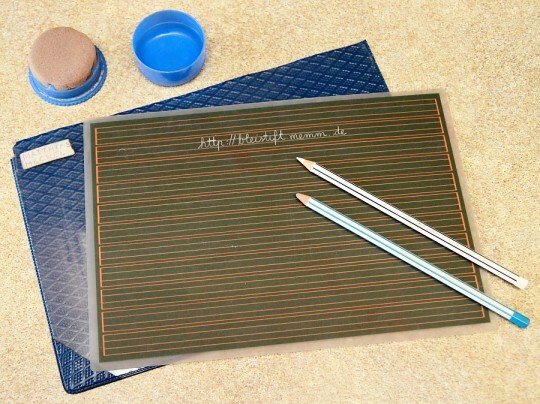 Even the writing slate Scolaflex is still available from Brunnen. Mine is from the late Seventies, just like the blue pencil. It has lines on one side to help getting the cap height and baseline right and is plain dark green on the other side. 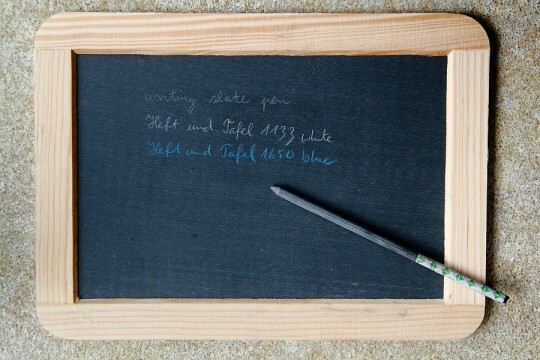 Writing slates from proper slate are still available for a reasonable price. I just bought this school writing slate (see photo) from Inigo Jones for £ 3.25 (~$ 5.25; ~€ 3.80). It even comes with a slate pencil. Unfortunately I was not able to find out whether the slate is real Welsh slate. Lexikaliker has a nice photo of a writing slate (Google translation) .